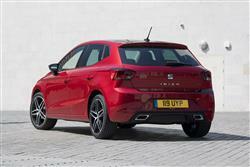 SEAT's MK5 model Ibiza supermini gets a range of strong engines, including an efficient 1.0 TSI three-cylinder unit. The experts at Car & Driving check it out. 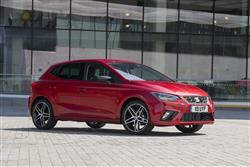 SEAT's Ibiza, now in its fifth generation, has been a budget alternative to the Volkswagen Polo for over 20 years. It's now smarter, better equipped and more sophisticated, especially in frugal 1.0 TSI petrol guise. SEAT's Ibiza has always been quite an endearing little supermini, provided you could stretch to the more sophisticated engines fitted to plusher, more powerful models. If budget or circumstance restricted you to an entry-level variant, things were very different. The cheapest versions of this model have often been saddled with the lowest-tech engineering offerings that the Volkswagen Group had to offer. But not now. In more recent times, Ibiza buyers have had access to one of the most sophisticated engines the Volkswagen empire makes, a three cylinder 1.0 TSI petrol unit. It's an engine also used in Volkswagen's Polo and Audi's A1 and offers the kind of performance you'd expect from a much bigger powerplant. The 1.0-litre TSI petrol engine is perfectly suited to the Ibiza. 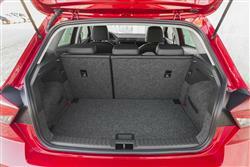 Its power begins to come in low down in the rev range and it pulls the hatchback strongly for such a compact unit. The three-cylinder engine produces either 95PS and 160Nm of torque. Or 115PS and 200Nm in the higher powered sportier FR model which can be ordered with optional DSG automatic transmission. For such a reasonably priced car, these figures are impressive. On the road, the numbers translate into very easy progress. 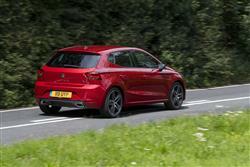 The torque is provided at a lowly 1500rpm, meaning even at very low revs, the Ibiza 1.0 TSI pulls well. It doesn't have much of a top end though, so to maintain swift progress, it's better to change gear early and ride the swell of torque. In the 95PS version, 62mph from rest takes 10.4s en route to 119mph. 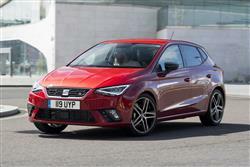 As for on the road driving dynamics, well SEAT says these have been improved thanks to the adoption of a hi-tech MQB platform that is 30% stiffer. As before, there's an optional 'SEAT Drive Profile' system that offers adaptive damping with two modes - comfort or sports-oriented. The Comfort/Sport selector switch also influences the feeling of the power steering and it'll alter the shift times of the DSG gearbox where automatic transmission has been specified. The MK5 model version of this SEAT isn't available in three-door form any more, but the Spanish maker says it retains plenty of sporty style potential customers tend to want. From a styling perspective, it's clearly an Ibiza, but one that has undergone a process of evolution, with a so-called 'x-shaped' design that looks more dynamic than before. The front and rear overhangs are very short and at the front of the car, triangular full-LED headlights dominate. The longer wheelbase and window graphics accentuate the size of this model too. Under the skin, the car is based on the Volkswagen Group's latest MQB platform, which will also be used in next-generation versions of Volkswagen's Polo and Skoda's Fabia. The Ibiza is also bigger this time round, 87mm wider than before, while the 2,564mm distance between the axles represents a 95mm increase. 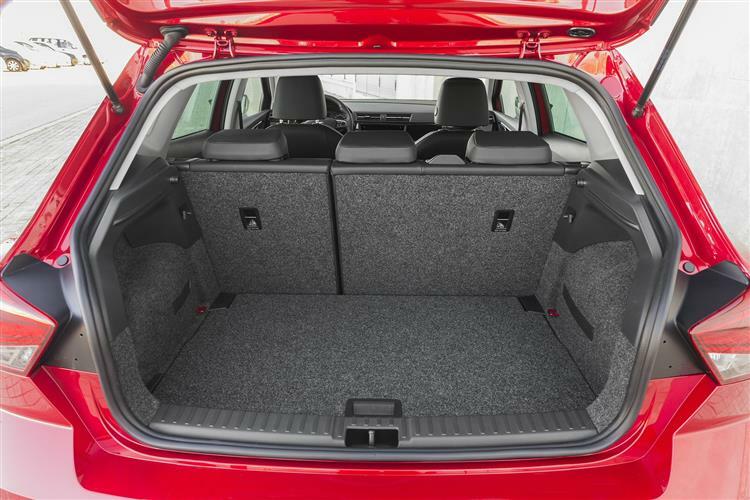 As a result, legroom in the back seats has increased by 35mm, while headroom has increased by 17mm in the back and 24mm in the front. The seats are 42mm wider and the boot area is 63-litres bigger, bringing total capacity up to a class-leading 355-litre figure. The loading height has also been lowered. Other things you'll notice inside include the fact that the controls and instruments are now more driver-orientated and the cabin feels of higher quality, thanks to colour-personalisable LED lighting, an 8-inch centre-dash touchscreen and a 'Full Link' connectivity system. The 1.0 TSI petrol engine we're looking at here comes with a choice of 'SE', 'FR' or 'XCELLENCE' trim. Prices start at just over £14,500, which means a price premium of about £600 over the older-tech 75bhp 1.0 MPI unit; we'd say that was worth paying. All variants offer this unit in 95PS form, but you have to choose sporty 'FR' trim to get the option of the pokier 115PS version of this powerplant. If you go for that uprated unit, you'll also be offered the option of DSG auto transmission. As for equipment, well the full-LED headlights are a highlight. Plus most models get 'Apple CarPlay' and 'Android Auto'/'MirrorLink' 'phone connectivity, plus buyers can specify a premium 8-inch touchscreen and a wireless charger with a GSM amplifier. In addition, there's the chance to add in a thumping 300-watt 'Beats' Audio system with 7 speakers and an 8-channel amplifier. Other features buyers might want include keyless entry with a 'heartbeat' engine start button, front and rear parking sensors and a higher quality rear view camera. 'FR' and 'XCELLENCE' variants get colour-personalisable LED interior lighting too. Safety-wise, there's 'Front Assist' autonomous braking, Adaptive Cruise Control and a 'Traffic Jam Assist' feature that can take over the driving from you at very low traffic jam speed. Being able to dip into the Volkswagen Group parts bin for the niftiest tech usually means a very low overall cost of ownership and that's certainly the case here. The entry-level 1.0-litre TSI 95PS petrol model delivers a combined fuel economy of 67.3 mpg, which equates to a CO2 figure of 98g/km. A start/stop system, which switches off the engine when the vehicle is at a standstill, is available across all current SEAT Ibizas. What else? Well there's SEAT's usual three year/60,000 mile warranty. That's unexceptional when rivals like Toyota and Hyundai offer five years of cover as standard and Kia offers up to seven years. However, the SEAT deal is extendable, so you might be able to negotiate on that. And it includes two years of Europe-wide roadside assistance. If you're looking for a budget-priced supermini and can overlook the slight price premium that comes with this 1.0 TSI engine, the Ibiza now offers a level of quality, equipment and economy that rivals struggle to match for the money. Introducing this three-cylinder powerplant into the range provides multiple benefits. Its economy and emissions are significantly better than the 75PS 1.0-litre 12V MPI unit it effectively replaces and performance is stronger thanks to the turbocharger providing good low-down torque. This means even the lower-powered 95PS model is blessed with reasonable performance. 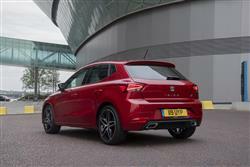 Overall, the relatively affordable price and brilliant engine make the Ibiza a tough car to beat in this segment. Running costs are kept to a minimum without sacrificing performance and the improved cabin, extra equipment and various other changes keep it looking and feeling sharp. To find your nearest Seat branch, please enter your location.